WHILE WE HAVE ALWAYS REVELED IN THE SWEET TASTE, SELDOM CONSIDER THE INCREDIBLE BENEFITS OF DATES. Children find Dates to be an easy portable snack and can ease cravings for high calorie, high fat snacks. Perfect substitute for candy and other empty calorie sweets. Dates contain nutrients necessary for growth & health. • Iron, the mineral that prevents anemia and which is part of the hemoglobin molecule in the blood. • Magnesium, which has an important role in the nervous system integrity and in energy production. The magnesium in dates aids protein synthesis, blood glucose control and muscle and nerve function in your body, and it helps regulate blood pressure. • Potassium, useful in cases of hypertension. Dates contain high amounts of potassium, that means dates are excellent for muscle recovery and ideal as a pre or post workout food. • Calcium & Phosphorous, essential for healthy bones. • Vitamin A, for healthy skin and eyesight. • Vitamin B3 (niacin) protecting from fatigue and dementia. Niacin also reduces triglycerides and cholesterol levels (LDL) in the blood, thus protects the heart and circulatory system. Clinical trials show dates reduce triglyceride levels. • Folic Acid, essential for protection against atherosclerosis and heart problems, and for protein metabolism. Dates help to naturally fuel your body. High amounts of good carbohydrates, in the form of simple sugars that are easily absorbed, which gives the brain and body a natural boost. In addition to that, dates provide significant amounts of fiber thus releasing the energy slowly and therefor, helps you keep going for longer. Dates provide 12% of the recommended daily value for fiber (3 grams) in only 1/4 cup (40g) serving. The insoluble fiber in dates (a type of fiber commonly found in the pits and the skins of the fruit) provides great roughage to clean out your digestive tract. Date fiber can be an excellent source of dietary fiber that can be used as an ingredient with good functional properties. 84-94% insoluble fiber. Dates contain a particularly beneficial type of soluble fiber known as beta-D-glucan. Dates supply 18% of the daily value for copper in a 3.5-ounce serving. Copper is an essential trace mineral that helps your body both absorb and use iron to form red blood cells. 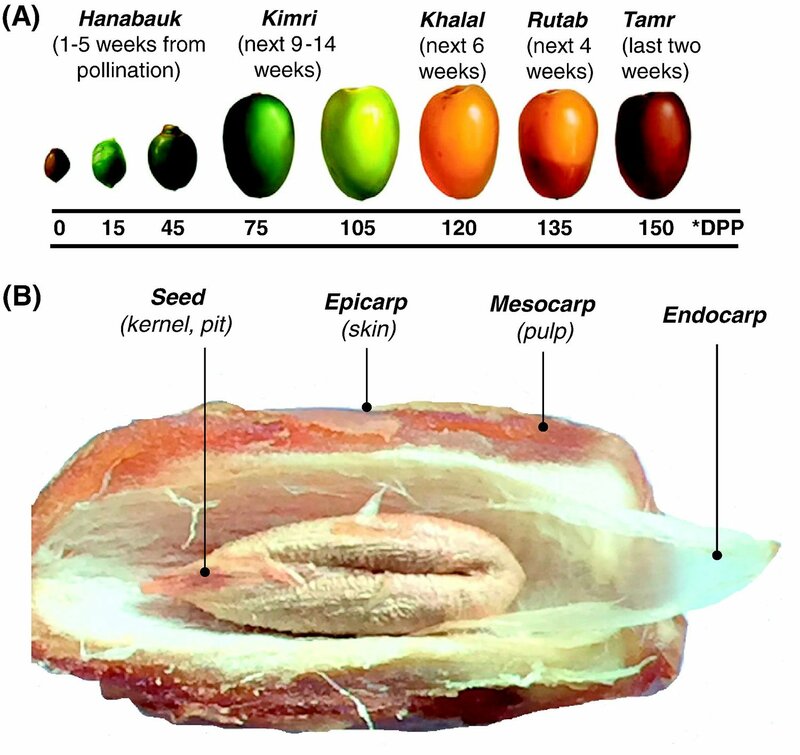 Date fruits develop through five different stages Hanabauk, Kimri, Khalal (or Bisr), Rutab, and Tamr as shown in Fig. 1. • Dates are lower on the glycemic index than bananas and grapes. pressure and the risk of cardiovascular disease, and most people don’t get enough of it. • Consuming a cup of chopped dates provides 63 milligrams of magnesium, which aids protein synthesis, blood glucose control, and muscle and nerve function, while also helping to regulate blood pressure. • Fluorine in dates is useful in protecting teeth against decay. • Selenium in dates helps to prevent cancer and is important in immune function. • Dates are considered a good supplement for correcting iron deficiencies and anemia. 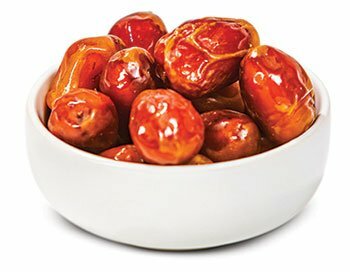 • The sulfur in dates can help stem the effects of SAR (Seasonal Allergic Rhinitis), which affects approximately 23 million people in the United States alone. 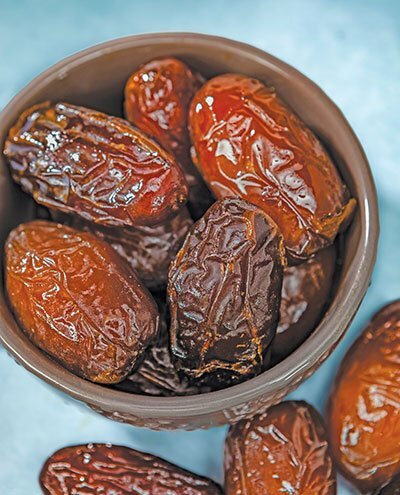 • Data suggests that consumption of date fruits may enhance colon health by increasing beneficial bacterial growth and inhibiting the proliferation of colon cancer cells. • In addition to its usual function as a soluble fiber, beta-D-glucan can also absorb and hold water, giving it the ability to add bulk and softness. • Dates are also a source of polyphenols (antioxidants that may lower inflammation) and may help to reduce chronic pain. • Amino acid analysis revealed that dates contained all the essential amino acids (Glutamic, aspartic, lysine, leucine, glycine and proline were the predominant). • Dates are rich in a variety of phytochemicals such as phenolics, sterols, carotenoids, anthocyanins, procyanidins and flavonoids. • Date have 5-3.9% soluble pectins, which render the fruit more tender and soft. • Major carotenoids found in dates are lutein, B-Carotene, zeaxanthin, and neoxanthin. • Polysaccharides from dates have been used as a functional food.